A former president of HPCC, Mr Shamsher Singh Surjewala, has said that the credit for the apex court verdict on the completion of the SYL canal given in favour of Haryana, goes to Indira Gandhi and Rajiv Gandhi who did every efforts to solve this problem. While the expatriate Punjabis are a formidable lot whose presence can be felt in economic as well as social arena of Punjab, there is no such phenomenon in Haryana. A Dhanbad-style mafia has allegedly emerged in the mining belt of Bhiwani district, which has been “extorting” money from truckers and tractor-trailer owners operating in the area. To promote Kurukshetra as a historical and religious tourist centre, the Department of Culture of the Union Government has sanctioned Rs 4.5 crore for developing infrastructure and put the city on the world tourist map. About 58 sheep were run over by a train near Ambala city railway station late last night at about 1 am. The sheep were on the railway track at the level crossing when they were run over by an Express train on the up line. Bodies of some sheep were also recovered from the down line. A railway police official said there were about 120 sheep when the accident took place. About 58 sheep died on the railway tracks. 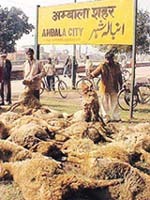 Dead sheep lying near Ambala City railway station. Demanding a CBI inquiry into the sensational Joginder Kaur murder case and the resignation of Haryana Speaker, Satbir Singh Kadian, for the alleged involvement of his relatives in the case, the HPCC today staged a dharna in front of the residence of the Deputy Commissioner here. With the arrest of Vijay, alias Chhote, the police today foiled the attempt of a gang of kidnappers to abduct a son of a doctor of Sampla township, near here. Talking to mediapersons here today, he said that on April 11, 1982, Indira Gandhi had inaugurated the digging of the SYL canal at Kapoori village located on the Haryana-Punjab border, near Ambala city. He said that by the end of 1987, the construction of 80 per cent portion of the canal was completed in Punjab and Haryana area. Later the construction was stopped due to an agitation by the Akali Dal. Mr Surjewala said that inspite of it, the Congress continued its efforts to get it completed. Former Prime Minister Rajiv Gandhi had motivated Punjab and Haryana to accept the Rajiv-Longowal accord. Later the Eradi Commission was also constituted for the purpose. The former HPCC chief said that if the Congress in Haryana came to power, it would install a human-size statue of Indira Gandhi at Kapoori village from where the digging of the SYL canal was launched. Similarly, a statue of Rajiv Gandhi would be installed at Badehra village (Karnal) where the Satluj water linked with the Yamuna water. Mr Surjewala said that the Union Government had been terminating the subsidy of Rs 2000 crore being given on diesel, petrol and kerosene. He said that similarly the subsidy on the fertilisers was also being withdrawn from April this year. He said that it would ruin the farmers and the common man. He alleged that the government was also planning to discontinue the “government procurement policy”. He said that to protest against this decision of the government, the Haryana Kisan Congress and the HPCC would be organising a state-level rally at Kurukshetra in which senior leaders of the party high command would also took part. When asked whether Mr Bhajan Lal would also participate in this rally, he said that an invitation for this rally would be sent to all the senior leaders of the state Congress. The reason for this is stated to be cultural. While the NRI Punjabis have a strong sense of attachment to their state, this sentiment is apparently missing in the case of Haryanavis. According to an estimate, compiled by a premier agency, there are more than 3700 Haryanavis who live abroad with many of them doing exceedingly well in various professions. However, till date there has been no significant attempt to encourage the overseas Haryanavis to invest in the state. According to the estimate mentioned above , more than 900 persons of Haryana origin live in the USA. About 500 Haryanavis are in Saudi Arab, 350 each in Germany and Canada and more than 340 live in Dubai. Well-to-do Haryanavis are also found in other prosperous countries such as Japan, Hong Kong and Singapore. Among the19 districts of Haryana more than 550 are from Ambala. More than 400 persons each from Kurukshetra and Fatehabad are settled abroad. Districts such as Yamunanagar, Kaithal, Bhiwani, Gurgaon, Faridabad and Karnal each have at least 220 persons living abroad. Rewari also accounts for more than 20 wealthy NRIs while there are substantial number of expatriates from Sirsa, Hisar, Jind, Panipat, Sonepat and Jhajjar. However, so far there has not been any attempt to tap these NRIs for investing in the state of their origin. “The Sikhs, wherever they are, go to gurdwaras which help develop a community consciousness among them. Even the non-Sikh Punjabis are also united through their language”, explained a Haryana official who added that NRI Haryanavis form a part of the mass of Hindi speaking Indians living abroad and the nebulous regional identity of the Haryanvis gets further diluted in the process. Nevertheless, it may be worthwhile to explore the possibility of roping in NRI Haryanavis for industrial advancement of the state, he felt. Levelling this allegation, the Congress MLA from the Tosham Assembly constituency, Mr Dharamvir, submitted a memorandum to the Haryana Governor, Babu Parmanand, here today. He demanded a CBI inquiry into the activities of the mining mafia, which, he alleged, was patronised by a member of the ruling family. Later talking to newsmen, Mr Dharamvir said barriers had been erected by certain anti-social elements on all roads leading to the Khanak, Nigana, Dadam and Delheri areas of Bhiwani district since December 12. These elements, he alleged, were collecting Rs 250 to Rs 2000 per vehicle carrying crushed stone. This way, they were collecting about Rs 15 lakh per day. Alleging that an office-bearer of the youth wing of the INLD was acting as the front man of those who were collecting money. He said when residents of the area complained to the Deputy Commissioner and officials of the Mines and Geology Department, they denied that anybody had been authorised to collect such money. Mr Dharamvir said about 200 stone crushers were functioning in the area and about 50,000 persons were dependent on the crushers and other mining activities for their livelihood. They had been badly hit by the activities of the mafia. He said the Governor had assured him that he would inquire into his allegations. He said during the proposed visit of the Governor to Bhiwani on January 27, a large number of people from the area would meet him and apprise him of the situation. Giving this information here today, the Deputy Commissioner, Mr Abhilaksh Likhi, said the amount would be spent on enhancing tourist attraction, including Harsh ka Teela, Sheikh Chehli’s Tomb, Sthaneshwar Mandir and Bhadrakaali Mandir. With this amount an open air theatre would also be constructed and a conference of travel agents organised with a publicity campaign, Mr Likhi added. The Union Tourism Minister, Mr Jagmohan, had visited Kurukshetra’s religious places on January 15 last and had sanctioned Rs 1.43 crore for commissioning a light and sound show programme, here. About 58 sheep were run over by a train near Ambala city railway station late last night at about 1 am. The sheep were on the railway track at the level crossing when they were run over by an Express train on the up line. Bodies of some sheep were also recovered from the down line. A railway police official said there were about 120 sheep when the accident took place. About 58 sheep died on the railway tracks. Three shepherds claimed this morning that the sheep belonged to them. They told the police that they were residents of Patiala district and had stopped over near Jandli last night. The sheep must have strayed out last night and in the morning when they were searching for the sheep, they came to know about the incident, they added. Addressing protesters, the HPCC chief, Mr Bhupinder Singh Hooda, said the Congress was demanding a CBI probe into the case since the police investigation was not fair. He also demanded the resignation of the Speaker as three of his relatives were allegedly involved in the case. Urging the Chief Minister not to take political mileage out of the recent Supreme Court directive to the Punjab Government to complete the construction of the SYL Canal, Mr Hooda claimed that the directive was mainly based on the Rajiv-Longowal Accord of 1985. 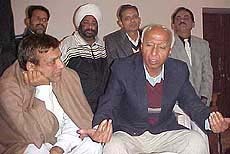 He appealed to the political parties to sink differences and make united efforts for the early completion of the canal. Later, in a memorandum submitted to the Governor through the Deputy Commissioner, the HPCC expressed concern over the deteriorating law and order situation in the state. The police has also launched a manhunt to apprehend Surinder, an accomplice of the kidnappers. The 26-year-old suspect belongs to Kheri-Sampla village. Mr Atar Singh Ahlawat, SSP, said Vijay, 27, and Surinder were members of the gang involved in kidnapping 20-year-old son of a sweets shop owner of Nangloi (Delhi) in February, 2000, and released him after allegedly getting a ransom of Rs 20 lakh. Two members of this gang, Ajay and Sucha, were arrested by the Delhi police on May 24, 2000. Mr Ahlawat said Vijay and Surinder were also planning to kidnap a son of a wealthy politician of Sampla. Vijay, he said, was arrested by the Sampla police while Surinder, who was also involved in car thefts, was still absconding. A man and his son died in a road accident last night. According to police sources, Raj Kumar Gupta and his son Sheetal of Ludhiana were coming in their Maruti car from Uttar Pradesh when their vehicle collided head-on with a truck near Mandoli village on the Yamunanagar-Saharanpur highway. Both of them died on the spot. A case has been registered. The post of Secretary, held by officers of the rank of Financial Commissioner in Haryana, has been renewed as Principal Secretary. The proposal, approved by the Chief Minister, was notified today, official sources said.